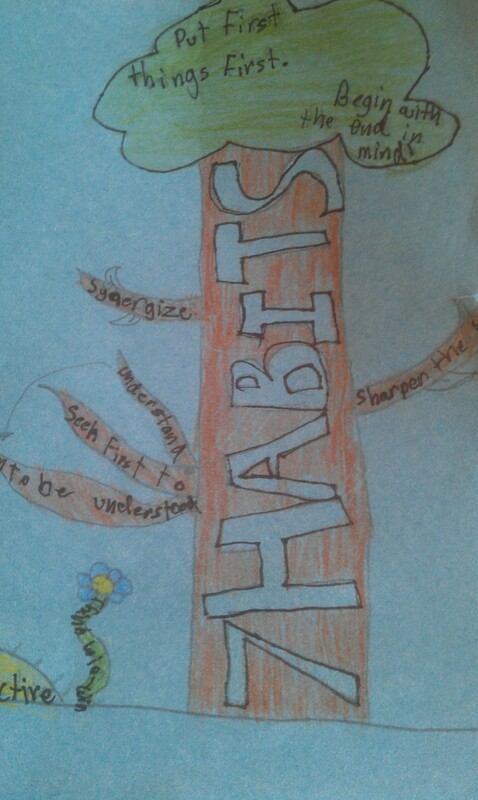 It’s at the top of the 7 Habits tree my son brought home recently. His school teaches Stephen Covey’s, 7 Habits of Highly Effective People, and they’ve been finding creative ways for the kids to engage the material. Though it tops his tree, putting first things first is actually Habit #3. What? I suppose there is a good reason it’s not first. Intuitively it seems off, but there’s probably a good explanation for making it third. It’s been a while since I’ve read the Covey book, but I know something about rationalizing putting the first things in my life somewhere other than first. What should be first in my life? God. What does my relationship with God actually look like? I’ll give Him what’s left over. My time, my talents, my energy, my money, my life. Not quite the way you treat what’s at the top. In truth, I’m guilty of putting myself first most days. Sometimes, family or friends or even work get up there, but not often or for long. Really, even when I’m “putting others first”, it’s often for some personal gain, benefit, advantage, warm fuzzy, etc. Still about me. I could blame the culture. Rugged individualism is what built this great nation called the United States, right? I could blame my parents. I wasn’t held enough or positively reinforced enough or challenged or supported or whatever the latest psychologists say we need more of. I could blame teachers or girlfriends or movies or a host of other forces outside myself. I haven’t been loved the right way or taught the right lessons or given the right tools. Ultimately I have to look in the mirror and say, whatever’s first in my life, I put there. What I set at the top of my tree is a choice. A choice I make. A decision I have been given the power and ability to choose. If God isn’t first on my list, it’s only because I haven’t chosen to make God first in my life. Third is probably about right when I really think about it. But in thinking about it, I have taken the first step in changing my priorities. Knowing you’re sick is essential if you are to be made well. Awareness is empty unless followed by action. I recognize my out-of-whackness and I change. CAUTION: The action taken should not become a form of legalism. I don’t need the new “rules for being good” to become first. This was the Pharisee’s problem. Substituting one idol for another won’t get us very far. So as I become aware of my need and can begin to take action to right the course. I spend time connecting with God. Prayer and study begin to shape me. I seek God in the ordinary and am surprised by God in the extraordinary. I keep God in the front of my mind; when I love my wife, when I play with my children, when I share thoughts through a blog, when I talk with friends and neighbors. Putting first things first suggests there are other things. By placing God at the top of my tree, all the other things take on more meaning and are cast in a different light. They become more important as they are related to God, not obstacles or distractions to experiencing God. Other relationships actually become ways in which I can experience God more fully. By “demoting” these relationships they are elevated. What? It’s true. That’s the marvelous mystery of it all. Putting God first elevates all of life. Seeing God in my wife draws me to serve her more. Nurturing an awareness of God in my children inspires me to spend more quality time with them. Hearing God in neighbors, leads me to listen more closely to their needs and dreams. Becoming more aware of God and acting on my heightened awareness. Now that sounds like putting first things first. At least it’s where I’m going to start.